It is the job of California condor release site managers to monitor the condor flock. What this means is that they must attempt to locate every condor in their region on a daily basis. This kind of monitoring is above and beyond what is done for other species. Can you imagine trying to locate every single bluebird or coyote on earth, every day of the year? Such a feat is made possible only by the year-round work of biologists and volunteers, technologies such as radio and satellite telemetry (a.k.a. 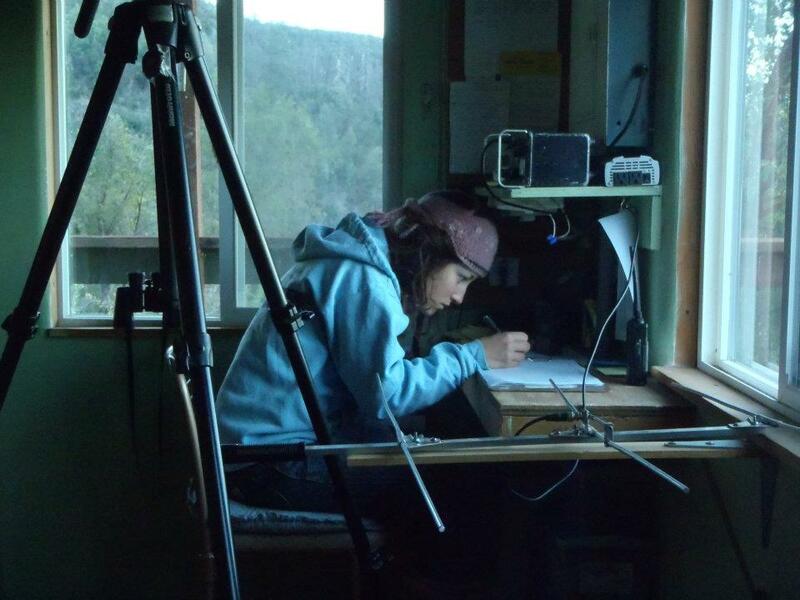 GPS), the regular capture of individuals for wing-tagging and blood lead tests, and the restricted condor population and range. Even with these advantages, it is a rare day that every individual bird is contacted. Once a condor has been off the radar for more than three days, targeted attempts are made to get a “visual” (visual observation) or a “signal” (radio-transmitter signal). After 5-7 days flights are chartered to search the remote parts of the condor range for the missing bird. Finding missing condors is important whether they are living or dead. If a condor is sick or injured, then they can be captured and treated. If they have been killed, determining the causes of death is also vital to the success of the program. A day of tracking usually starts at 9 a.m. or later, when condors are up and moving. Thermal updrafts, which occur when the ground is warmed by the sun and the surrounding air rises, are a boon to a foraging condor. So condor watching doesn’t require the pre-dawn motivation that other bird watchers must muster. Once at the office, we look at our records for the previous day’s condor activity and set our game plan for the day based on specific individuals we are looking for, or where a wild carcass may have been spotted. As we drive or hike through condor territory we stop often to “take signals.” We receive the signals emitted by radio-transmitters on the birds wings or tail feathers, using a directional antenna and handheld receiver (as pictured). Since each condor has its own unique frequencies, we can tell who we’re hearing, and in what direction they are from our location. Additionally, by listening closely to the intensity of the signal we can make some assumptions about distance from the observer, and whether the bird is perched or flying. Over the course of the day we may get multiple signals from the same bird that may indicate longer range movements within their range (between canyons or even between release sites). Over the course of a tracking day we will also make visual observations of the condors we come across. These observations may just be a flyby, but when we’re lucky we might get to see the birds feed, or display mating behavior. All of this information is recorded in order to document the relative health of the bird (e.g. no symptoms of lead poisoning), monitor breeding efforts, and provide insight into location of the bird if they do go missing. A tracking day usually ends at about 4 when condors are starting to seek out their roost for the night. When we make it back to the office we input this data and eventually incorporate it with GPS data downloaded from satellites. Hopefully, we contacted all the birds we were looking for! If not, we will increase our efforts to contact missing birds the following day. 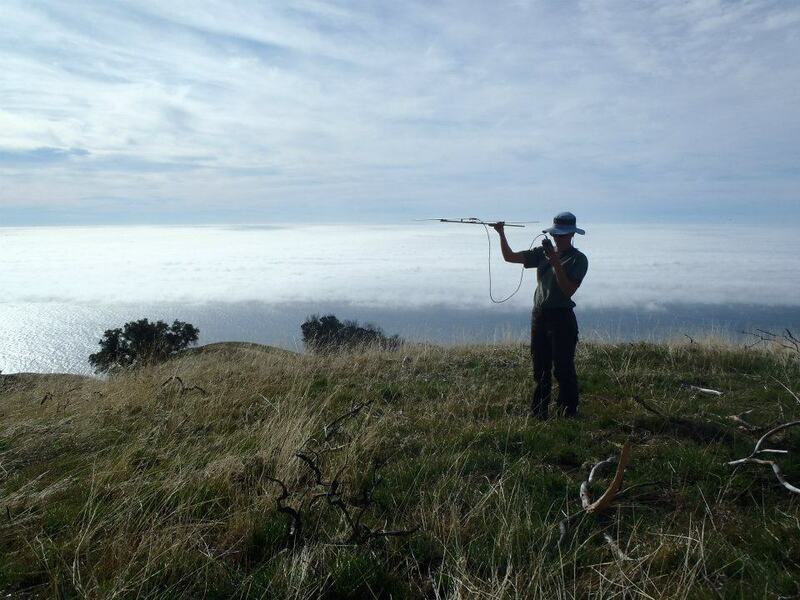 Condor biologist Erin Brannon tracks condors in the mountains of Big Sur, CA. Me taking signals from basecamp within Ventana Wildlife Society Sanctuary in Big Sur, CA. 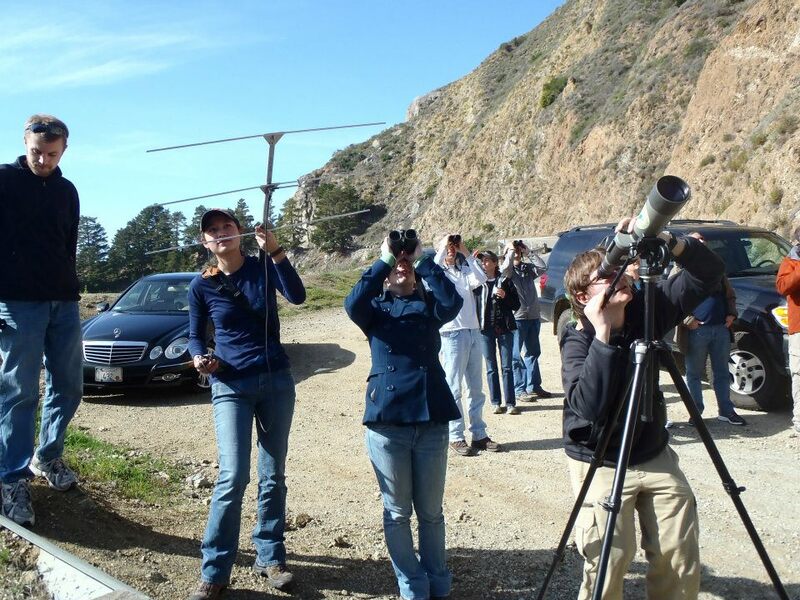 Volunteers and visitors taking signals and getting visuals of condors along the Highway 1 in Big Sur, CA.